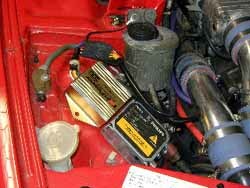 Most will say that the stock ignition system of the Z32 is sufficient unless running extreme levels of boost. However there are others that say they get increased throttle response and a slight performance gain from this modification. HKS's marketing gurus say "The Transistor Ignition controls current to the coil via an impedance matching circuit, to produce a longer spark duration. This powerful combination creates greater horsepower at higher RPM levels and increased throttle response at lower RPM levels." 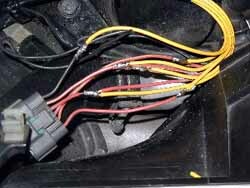 Fundamentally, the installation requires that the red wire go to a +12V ignition source, the yellow wires go to the igniter wires on each coil and the black wire goes to ground. The following steps outline the procedure performed for my install. 1. Find a suitable mounting point for the TPIA, Mine is installed near to the Power Steering Reservoir next to my HID ballast (1.). Mount it by drilling a hole and screwing it down, or the velcro strips I used provide more than adequate adhesion . 2. 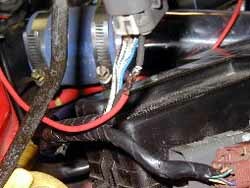 Disconnect the cable from the power transistor to the coil packs, located at the front of the engine on the passenger side (2.). Disconnect the plug with six wires coming out of it, one black and five red with assorted stripes. The black wire has a long loop coming out of the insulation, this is for checking the timing on cylinder #1. 3. Cut back the black wire shield to expose the underlying wires (3. )and then cut away the insulation on each wire for about 3/4". Stagger the cuts to reduce the risk of unwanted shorts between the wires and also to make a much neater job on the final wrap (4.). 4. Route the wires from the TPIA harness to close to the stripped wires, then cut the yellow ones to length. They should be of staggered lengths to coincide with the exposed wires from step 3. Solder each yellow wire to one of the igniter wires, it doesn't matter which one goes to which as the wires are equivalent. Using the brass u shaped wire clips provided with the TPIA helps here. 5. Using electrical tape insulate each joint separately and then rewrap the wires together. 6. Find a source of 12V IGN power. 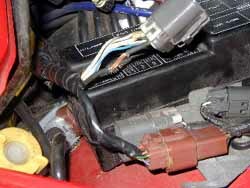 Nissan's source of power for all the ignition coils comes from the ignition coil relay located in the relay/fuse box. 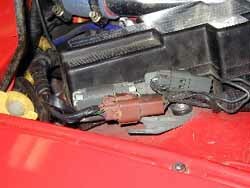 It's located on the front driver side of the engine compartment. Next to this box there is a brown connector, a large gray/white connector and a gray connector. Disconnect the gray/white connector in figure (5.) and expose about 3/4" of wire from the thick black cable (6.). 7. Run a new wire from close to the power transistor to the fuse box connector disconnected in step 6. 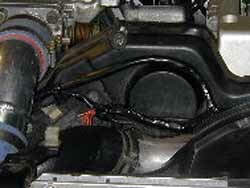 Run this parallel with the other PTU wires across the front of the engine to get clearance from the fan, pulleys etc. Solder it into the black wire exposed in step 6. and insulate it (7.). Reconnect the gray/white connector. 8. Using a bullet connector (or similar electrical connector) join the wire from step 7. to the red wire from the TPIA harness. By using a bullet connector its possible to disconnect the TPIA and all wires in front for maintenance reasons. 9. 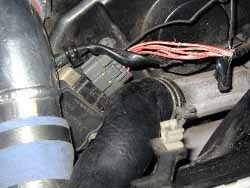 Insulate all the wires with electrical tape and tidy up everything with cable ties (8.). 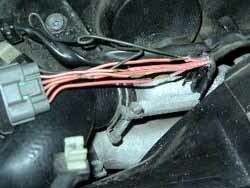 Find a suitable ground connector (I used the bracket on the Power Steering Reservoir which may not be the most ideal was the best option given we were rushed and didn't feel like drilling into the body) (9.). 10. Reconnect the battery and give it a try.... hopefully the car will start and the red light on the TPIA illuminates.